Lot Size: 5851 Square Ft.
near xing of Cambridge St. & Brighton Ave., stores & buses. Each apartm. 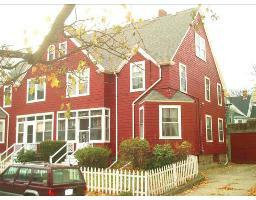 has wood floors, fireplace mantels and lots of period detail. Owner's side has drive w/a 1 car gar. & 2cd full bath in the basement. The other apt. has it's own drive & 2 car gar! A brick firewall separates each apt from the basement to the roof. Each apt has it's own water meter. Large rear deck perfect for Summer parties. 3d floor rooms in each apt. are unheated.